Advisor: Robert A. Ferguson, George Edward Woodberry Professor in Law, Literature and Criticism, Columbia University, National Humanities Center Fellow. How did Thomas Paine’s pamphlet Common Sense convince reluctant Americans to abandon the goal of reconciliation with Britain and accept that separation from Britain — independence — was the only option for preserving their liberty? By January 1776, the American colonies were in open rebellion against Britain. Their soldiers had captured Fort Ticonderoga, besieged Boston, fortified New York City, and invaded Canada. Yet few dared voice what most knew was true — they were no longer fighting for their rights as British subjects. They weren’t fighting for self-defense, or protection of their property, or to force Britain to the negotiating table. They were fighting for independence. It took a hard jolt to move Americans from professed loyalty to declared rebellion, and it came in large part from Thomas Paine’s Common Sense. Not a dumbed-down rant for the masses, as often described, Common Sense is a masterful piece of argument and rhetoric that proved the power of words. Literary nonfiction; persuasive essay. In the Text Analysis section, Tier 2 vocabulary words are defined in pop-ups, and Tier 3 words are explained in brackets. Compare Paine’s message and rhetoric in 1776 with that of a moderate Patriot in 1768. We recommend the first interactive exercise, From Resistance to Revolution, to lead students into the revolutionary mindset of 1776. Comparing Paine’s radical call for independence with a Patriot’s moderate plea for resistance in 1768 illuminates the dramatic transition that occurred in the eight years preceding the Declaration of Independence. Lead students through an initial overview of the essay (see Background). To begin, they could skim the full text and read the pull-quotes (separated quotes in large bold text). What impression of Common Sense do the quotes provide? What questions do they prompt? Then guide students as they read (perhaps aloud) Section III of Common Sense and the Appendix to the Third Edition (pp. 10-19 and 25-29 in the full text provided with this lesson). The man at right does not look angry. To us, he projects the typical figure of a “Founding Father” — composed, elite, and empowered. And to us his famous essays are awash in powdered-wig prose. But the portrait and the prose belie the reality. Thomas Paine was a firebrand, and his most influential essay — Common Sense — was a fevered no-holds-barred call for independence. He is credited with turning the tide of public opinion at a crucial juncture, convincing many Americans that war for independence was the only option to take, and they had to take it now, or else. Common Sense appeared as a pamphlet for sale in Philadelphia on January 10, 1776, and, as we say today, it went viral. The first printing sold out in two weeks and over 150,000 copies were sold throughout America and Europe. It is estimated that one fifth of Americans read the pamphlet or heard it read aloud in public. General Washington ordered it read to his troops. Within weeks, it seemed, reconciliation with Britain had gone from an honorable goal to a cowardly betrayal, while independence became the rallying cry of united Patriots. How did Paine achieve this? Over a year elapsed between the outbreak of armed conflict and the Declaration of Independence. During these fifteen months, many bemoaned the reluctance of Americans to renounce their ties with Britain despite the escalating warfare around them. “When we are no longer fascinated with the Idea of a speedy Reconciliation,” wrote Benjamin Franklin in mid-1775, “we shall exert ourselves to some purpose. Till then Things will be done by Halves.”1 In addition, there remained much discord among the colonies about their shared future. “Some timid minds are terrified at the word independence,” wrote Elbridge Gerry in March 1776, referring to the colonial legislatures. “America has gone such lengths she cannot recede, and I am convinced a few weeks or months at furthest will convince her of the fact, but the fruit must have time to ripen in some of the other Colonies.”2 In this environment, Common Sense appeared like a “meteor,” wrote John Adams,3 and propelled many to support independence. Many noted it at the time with amazement. Introduction: The ideas I present here are so new that many people will reject them. Readers must clear their minds of long-held notions, apply common sense, and adopt the cause of America as the “cause of all mankind.” How we respond to tyranny today will matter for all time. Section One: The English government you worship? It’s a sham. Man may need government to protect him from his flawed nature, but that doesn’t mean he must suffocate under brute tyranny. Just as you would cut ties with abusive parents, you must break from Britain. Section Two: The monarchy you revere? It’s not our protector; it’s our enemy. It doesn’t care about us; it cares about Britain’s wealth. It has brought misery to people all over the world. And the very idea of monarchy is absurd. Why should someone rule over us simply because he (or she) is someone’s child? So evil is monarchy by its very nature that God condemns it in the Bible. Section Three: Our crisis today? It’s folly to think we should maintain loyalty to a distant tyrant. It’s self-sabotage to pursue reconciliation. For us, right here, right now, reconciliation means ruin. America must separate from Britain. We can’t go back to the cozy days before the Stamp Act. You know that’s true; it’s time to admit it. For heaven’s sake, we’re already at war! Section Four: Can we win this war? Absolutely! Ignore the naysayers who tremble at the thought of British might. Let’s build a Continental Navy as we have built our Continental Army. Let us declare independence. If we delay, it will be that much harder to win. I know the prospect is daunting, but the prospect of inaction is terrifying. “It is necessary to be bold,” wrote Paine years later on his rhetorical power. “Some people can be reasoned into sense, and others must be shocked into it. Say a bold thing that will stagger them, and they will begin to think.”4 Keep this idea front and center as you study Common Sense. As an experienced essayist and a recent English immigrant with his own deep resentments against Britain, Paine was the right man at the right time to galvanize public opinion. He “understood better than anyone else in America,” explains literary scholar Robert Ferguson, “that ‘style and manner of thinking’ might dictate the difficult shift from loyalty to rebellion.”5 Before Paine, the language of political essays had been moderate. Educated men wrote civilly for publication and kept their fury for private letters and diaries. Then came Paine, cursing Britain as an “open enemy,” denouncing George III as the “Royal Brute of England,” and damning reconciliation as “truly farcical” and “a fallacious dream.” To think otherwise, he charged, was “absurd,” “unmanly,” and “repugnant to reason.” As Virginian Landon Carter wrote in dismay, Paine implied that anyone who disagreed with him “is nothing short of a coward and a sycophant [stooge/lackey], which in plain meaning must be a damned rascal.”6 Paine knew what he was doing: the pen was his weapon, and words his ammunition. He argued with ideas while convincing with raw emotion. “The point to remember,” writes Ferguson, “is that Paine’s natural and intended audience is the American mob…. He uses anger, the natural emotion of the mob, to let the most active groups find themselves in the general will of a republican citizenry.”7 What if Paine had written the Declaration of Independence with the same hard-driving rhetoric? NO man can deny, without abandoning his God-given ability to reason, that all men enter into existence as equals. No matter how lowly or majestic their origins, they enter life with three God-given RIGHTS — the right to live, to right to live free, and the right to live happily (or, at the least, to pursue Happiness on earth). Who would choose existence on any other terms? So treasured are these rights that man created government to protect them. So treasured are they that man is duty-bound to destroy any government that crushes them — and start anew as men worthy of the title of FREE MEN. This is the plain truth, impossible to refute. Imagine yourself sitting down to read Common Sense in January 1776. How does Paine introduce his reasoning to you? He announces that his logic will be direct and down to earth, using only “simple facts” and “plain arguments” to explain his position, unlike (he implies) the complex political pamphlets addressed to the educated elite. His audience would understand “common sense” to suggest the moral sense of the yeoman farmer, whose independence and clear-headedness made him a more reliable guardian of national virtue (similar to Jefferson’s agrarian ideal). Why does he write “I offer nothing more” instead of “I offer you many reasons” or “I offer a detailed argument”? How does Paine ask you to prepare yourself for his “common sense” arguments? Be willing to put aside pre-conceived notions, he says, and judge his arguments on their own merits. What does he imply by saying a fair reader “will put on, or rather than he will not put off, the true character of a man”? He implies that any reader who would refuse to consider his arguments is narrow-minded. With the “on”–”off” contrast, he suggests that you, the individual reader, are open-minded and thus a fellow man of honor willing to consider a new point of view. Examine Paine’s “common sense” reasoning in his arguments for complete independence. In the following pages I offer nothing more than simple facts, plain arguments, and common sense: and have no other preliminaries to settle with the reader than that he will divest [rid] himself of prejudice and prepossession, and suffer [permit] his reason and his feelings to determine for themselves: that he will put on, or rather that he will not put off, the true character of a man, and generously enlarge his views beyond the present day. This paragraph begins with one of the most famous hyperboles in American writing. A hyperbole is an overstatement or exaggeration to emphasize a point. What are the two examples of hyperbole in this paragraph? With the hyperboles, how does Paine lead you to view the “cause” of American independence? View it, he says, from an overarching global perspective, not the narrow perspective of American colonists in the late 1700s. The hyperboles are ultimates — the most worthy of worthy causes, affecting the future now and forever. The American cause can lead mankind toward enlightened self-determination, driving forward the progress of civilization. Paine says this directly in his introduction: “The cause of America is in a great measure the cause of all mankind.” We’re not just talking taxes and representation, people. What tone does Paine add with the phrases “The sun never shined” and “even to the end of time”? A biblical and prophetic tone. The sun shining down on human endeavors suggests divine endorsement of the American cause — a cause that will bring light and freedom (“salvation”) to the world. Resisting the cause, Paine implies, would be resisting divine will. Let’s consider Paine as a wordsmith. How does he use repetition to add impact to the first part of the paragraph? 2. the phrases “of a city, a country, a province, or a kingdom” and “of a day, a year, or an age” [prepositions with multiple objects]. Read the section aloud to hear the insistent rhythm that elevates Paine’s prose to a rousing call to action (his goal in writing Common Sense). Paine ends this paragraph with an analogy: What we do now is like carving initials into the bark of a young oak tree. What does he mean with the analogy? A. This is the time to create a new nation. Our smallest efforts now will lead to enormous benefits in the future. B. This is the time to unite for independence. Discord among us now will escalate into future crises that could ruin the young nation. The sun never shined on a cause of greater worth. ’Tis not the affair of a city, a country, a province, or a kingdom, but of a continent – of at least one eighth part of the habitable globe. ’Tis not the concern of a day, a year, or an age; posterity are virtually involved in the contest and will be more or less affected, even to the end of time, by the proceedings now. Now is the seed time of continental [colonies’] union, faith and honor. The least fracture now will be like a name engraved with the point of a pin on the tender rind of a young oak; the wound will enlarge with the tree, and posterity read it in full grown characters. Paine includes multiple repetitions in this paragraph. What word repetition do you find? What sound repetitions do you find? Read the sentences aloud. What impact does the repetition add to Paine’s delivery? A stirring oratorical rhythm is achieved, like that of a solemn speech or sermon meant to convey the truth and gravity of an argument. Paine compares the attempts to reconcile with Britain after the Battle of Lexington and Concord to an old almanac. What does he mean? By referring the matter from argument to arms, a new area for politics is struck; a new method of thinking hath arisen. All plans, proposals, etc., prior to the nineteenth of April, i.e., to the commencement of hostilities [Lexington and Concord], are like the almanacs of the last year which, though proper [accurate] then, are superseded and useless now. Whatever was advanced by the advocates on either side of the question then, terminated in one and the same point, viz. [that is], a union with Great Britain. The only difference between the parties was the method of effecting it — the one proposing force, the other friendship; but it hath so far happened that the first hath failed and the second hath withdrawn her influence. Paine compares the goal of reconciliation to an “agreeable dream [that has] passed away and left us as we were.” Why doesn’t he aim harsher criticism here at the goal of reconciling with Britain? With this paragraph, Paine begins his argument against reconciliation and does not want to insult or alienate his readers at the outset. Everyone can hope, he implies: there’s nothing wrong with that, but we have to move on if a hope proves fruitless. With this in mind, what tone does he lead the reader to expect: cynical, impatient, hopeful, reasonable, impassioned, angry? Reasonable. The two sentences resemble the opening of a legal argument that promises a balanced appraisal of two options on the basis of known evidence (“principles of nature”) and honest ordinary reasoning (“common sense”). How does his tone prepare the resistant reader? While Paine promises a fair appraisal, look how he describes the two options in the last sentence. Why didn’t he use the usual terms for the two options — “independence” and “reconciliation”? In this vein, Paine chose DEPENDENCE instead of RECONCILIATION for Option 2 (staying with Britain). RECONCILIATION suggests the calm and rational agreement of two grownups, but Paine wants you to view reconciliation as the defeatist choice of spineless subjects who could never take care of themselves. In other words, DEPENDENCE. As much hath been said of the advantages of reconciliation, which, like an agreeable dream, hath passed away and left us as we were, it is but right that we should examine the contrary [opposing] side of the argument and inquire into some of the many material injuries which these colonies sustain, and always will sustain, by being connected with and dependent on Great Britain. To examine that connection and dependence, on the principles of nature and common sense, to see what we have to trust to [expect] if separated, and what we are to expect if dependent. Study Paine’s metaphors that compare the colonies’ readiness for independence to a child’s maturation into adulthood. Here Paine rebuts the first argument for reconciliation—that America has thrived as a British colony and would fail on her own. How does he dismiss this argument? He slams it down hard. “NOTHING can be more FALLACIOUS,” he yells. The argument is beyond misdirected or short-sighted, he insists; it’s a fatal error in reasoning. So much for calm and reasoned debate. But Paine is not having a temper tantrum in print. His technique was to argue with ideas while convincing with emotion. Paine follows his utter rejection of the argument with an analogy. Complete the analogy: America staying with Britain would be like a child _______. “America staying with Britain would be like a child remaining dependent on its parents forever and never growing up.” And who would want that, Paine implies? By writing “first twenty years of our lives” instead of, say, “first five years,” Paine alludes to the general consensus that a twenty-year-old is an adult. Paine goes one step further in the last sentence. What does he say about America’s “childhood” as a British colony? I have heard it asserted by some that as America hath flourished under her former connection with Great Britain, that the same connection is necessary towards her future happiness, and will always have the same effect. Nothing can be more fallacious than this kind of argument. We may as well assert that because a child has thrived upon milk, that it is never to have meat, or that the first twenty years of our lives is to become a precedent for the next twenty. But even this is admitting more than is true; for I answer roundly that America would have flourished as much, and probably much more, had no European power had anything to do with her. Test the chances of reconciliation against what you know about people’s reactions in similar crises throughout history, not against your own hopes and fears during this particular crisis. In other words, use common sense. At the start of this paragraph Paine mildly faults the supporters of reconciliation as unrealistic optimists “still hoping for the best.” By the end of the paragraph, however, they are cowards willing to “shake hands with the murderers.” How did he construct the paragraph to accomplish this transition? He poses two challenges to the supporters of reconciliation. If they can honestly answer each challenge, he asserts, and still support reconciliation, then they are selfish cowards bringing ruin to America. Paraphrase the first challenge (sentences 2–5). Paraphrase the second challenge (sentences 6–11). With what phrase does Paine condemn those who would still hope for reconciliation even if they were victims of British violence? They are men who “can still shake hands with the murderers,” i.e., men who have betrayed their fellow Americans and thus become as evil as the British invaders. There is no nuance in this condemnation, and thus no way for the reader to avoid its implications. Note how Paine weaves impassioned questions through the paragraph: “Are you only deceiving yourselves?” “Have you lost a parent or a child by their hands?” How do these questions intensify his challenges? Addressed to “you” directly and not a faceless “he or they,” the questions deliver an in-your-face challenge that allows no escape. Here’s my question to you: Answer it! or your silence will reveal your cowardice. Rewrite sentences #4 and #11 to change the second-person “you” to the third-person “he/she/they.” How does the change weaken Paine’s challenges? The reader is off the hook. Since the challenges are deflected from “you,” the reader, to the third-person “other,” no immediate personal reply is demanded. The reader can blithely read on and avoid the aim of Paine’s questions. Use this worksheet to examine Paine’s use of questions as persuasive devices throughout Common Sense, specifically the rhetorical question and the hypophora (questions with implied or stated answers, used for rhetorical impact). Men of passive tempers [temperaments] look somewhat lightly over the offenses of Britain and, still hoping for the best, are apt to call out, “Come, come, we shall be friends again for all this.” But examine the passions and feelings of mankind. Bring the doctrine of reconciliation to the touchstone of nature and then tell me whether you can hereafter love, honor, and faithfully serve the power that hath carried fire and sword into your land? If you cannot do all these, then are you only deceiving yourselves and by your delay bringing ruin upon posterity? Your future connection with Britain, whom you can neither love nor honor, will be forced and unnatural, and being formed only on the plan of present convenience, will in a little time fall into a relapse more wretched than the first. But if you say you can still pass the violations over [ignore or underrate them], then I ask, Hath your house been burnt? Hath your property been destroyed before your face? Are your wife and children destitute of [without] a bed to lie on or bread to live on? Have you lost a parent or a child by their hands and yourself the ruined and wretched survivor? If you have not, then are you not a judge of those who have. But if you have, and can still shake hands with the murderers, then are you unworthy the name of husband, father, friend, or lover, and, whatever may be your rank or title in life, you have the heart of a coward and the spirit of a sycophant. At this point, Paine pleads with his readers to write the constitution for their independent nation without delay. What danger do they risk, he warns, if they leave this crucial task to a later day? What historical evidence does Paine offer to illustrate the danger? He states that “some Massanello may hereafter arise” and grasp power, alluding to the short-lived people’s revolt led by the commoner Thomas Aniello (Masaniello) in 1647 against Spanish control of Naples (Italy). The Spanish ruler granted a few rights, but Masaniello was soon murdered, ending the uprising and its short-lived gains for the people. As his plea escalates in intensity, Paine exclaims “Ye that oppose independence now, ye know not what ye do.” To what climactic moment in the New Testament does he allude? While suffering on the cross before his death, Jesus calls out, “Father, forgive them; for they know not what they do” (Luke 23: 34); that is, his crucifiers do not know they are killing the Son of God. With this compelling allusion (which most readers would instantly recognize), Paine warns that opposing independence is as calamitous a decision for Americans as killing Jesus was for his executioners and for mankind. Paine heightens his apocalyptic tone as he appeals to “ye that love mankind” to accept a mission of salvation (alluding to Christ’s mission of salvation). What must the lovers of mankind achieve in order to save mankind? They must establish the “free and independent States of America” as the sole preserve of human freedom in the world. A desperate fugitive, “freedom” has been “hunted” and “expelled” throughout the world, and it is America’s mission to protect and nurture her. America’s victory will be mankind’s victory, not just the feat of thirteen small colonies in a distant corner of the world. NOTE: “A government of our own is our natural right” asserts Paine at the beginning of this excerpt. Six months later Thomas Jefferson asserted the same right in the opening of the Declaration of Independence. This Enlightenment ideal anchored revolutionary initiatives in America and Europe for decades. A government of our own is our natural right, and when a man seriously reflects on the precariousness of human affairs, he will become convinced that it is infinitely wiser and safer to form a constitution of our own in a cool deliberate manner, while we have it in our power, than to trust such an interesting event to time and chance. If we omit it now, some Massanello* may hereafter arise who, laying hold of popular disquietudes [grievances], may collect together the desperate and the discontented, and by assuming to themselves the powers of government, finally sweep away the liberties of the continent like a deluge. Should the government of America return again into the hands of Britain, the tottering situation of things will be a temptation for some desperate adventurer to try his fortune; and in such a case, what relief can Britain give? Ere [before] she could hear the news, the fatal business might be done, and ourselves suffering like the wretched Britons under the oppression of the Conqueror [William the Conqueror in 1066]. Ye that oppose independence now, ye know not what ye do. Ye are opening a door to eternal tyranny by keeping vacant the seat of government…. O ye that love mankind! Ye that dare oppose not only the tyranny but the tyrant, stand forth! Every spot of the old world is overrun with oppression. Freedom hath been hunted round the globe. Asia and Africa have long expelled her.—Europe regards her like a stranger, and England hath given her warning to depart. O! receive the fugitive, and prepare in time an asylum for mankind. Write a how-to essay on persuasive writing using Common Sense as the focus text and this statement by Thomas Paine as the core idea: “Some people can be reasoned into sense, and others must be shocked into it. Say a bold thing that will stagger them, and they will begin to think.” –Letter to Elihu Palmer, 21 February 1802. 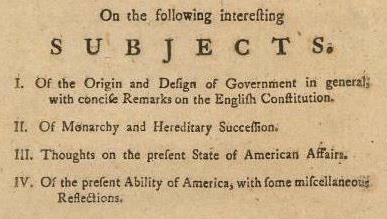 See colonists’ and newspapers’ responses to Common Sense in the primary source collection Making the Revolution (Section: Common Sense?) to examine how Paine turned public opinion in 1776. Note the critical pieces by John Adams, Hannah Griffitts, and others. What can be learned about Paine’s effectiveness by studying his critics? *For a helpful discussion of Paine’s response to the “horrid cruelties” of the British in India, see J.M. Opal, “Common Sense and Imperial Atrocity: How Thomas Paine Saw South Asia in North America,” Common-Place, July 2009. Images courtesy of the New York Public Library Digital Library. 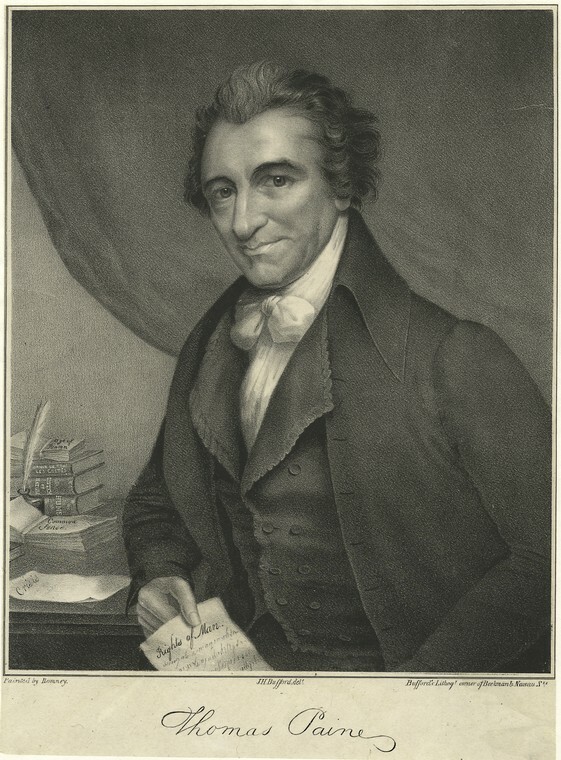 Portrait of Thomas Paine by John Henry Bufford (1810-1870), engraving by Bufford’s Lithography, ca. 1850. Record ID 268504. 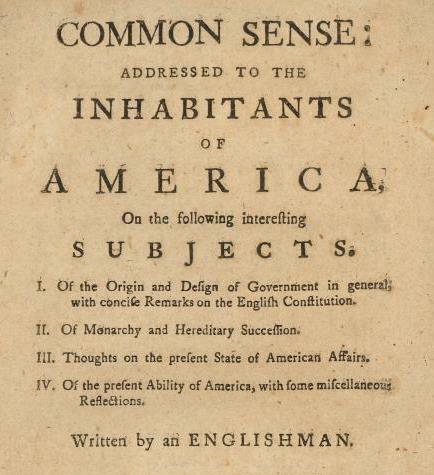 Title page (cover) of Common Sense, 1776. Record ID 2052092. I love it. It is very interesting and will keep the students on their toes, especially when it comes to their application of the use of close reading and rhetorical devices. Normally, I do a Socratic Seminar on an excerpt of Paine's Common Sense and start with the opening question of "What is mightier, the pen or the sword?" after citing a few lines from the source. This is a thorough and comprehensive look into the timeliness and significance of the document. The timing and text analysis is particularly useful. A couple of the question answers could be considered correct in the question section. A good lesson. I use a 20 page excerpt with my higher level students, and the questions you pose are useful. For my struggling learners, I used your excerpts and follow-up persuasive essay assignment, with much success. It led to good discussions in class about how to get something done. The discussions led to such items as the Ferguson riots and their effectiveness. thanks for your efforts!